El Salvador is hands-down a gorgeous country. It has volcanic mountain ranges, rainforests, lakes, valleys—and most stunning of all—the radiant Pacific coast. Experiencing the beauty and the bounty of its land, the possibility inherent in all El Salvador’s natural resources is palpable. This past year I was on a delegation to El Salvador to meet producer cooperators and look for ways that we could potentially develop co-op-to-co-op trade relationships. I traveled with a group of Americans from food co-ops located around the United States. Many of us on the trip work in different roles in our co-ops as board members, managers and consultants. The trip was sponsored by the National Cooperative Business Association (NCBA) and was a first step in a four year project funded by USAID out of the US foreign aid budget. We were there to determine the best use of NCBA’s resources to further cooperative business development in a country seeking to rebuild its post-war economy. When we got there, we realized El Salvador and its people have many urgent needs. There are still visible scars from the civil war in the 1980s. Farmland had been abandoned by its owners and tenants because the guerillas often abused the local people; many of them had gone to live in refugee camps. Poverty is rampant and dire; 38 percent of the people live below the national poverty line, and 15 percent of them make less than $2 a day. Security issues also still plague El Salvador since the war. Corruption, gangs and graft pose barriers to doing business. Crime is a serious economic, social and political issue for the country’s leadership. Robberies and hijackings are a common occurrence, affecting everyone, residents and visitors alike. In the last decade, the country has been rebuilding in earnest, and co-ops are helping to provide an impetus. Co-ops, with their values of transparency in business, represent a refreshing change, although progress is slow. Many of the people now rebuilding are former guerillas; however, there is a tacit agreement among all people that it is time to put aside arms and move forward peacefully. There are a lot of passionate people in these co-ops, doing important things for the right reasons. Without exception we were greeted warmly by our fellow cooperators, and left each meeting with the spark of newfound co-op friendships. One co-op was particularly striking. The way to El Jabali organic coffee co-op in the San Salvador district, was up a steep dirt road, rutted, and rocky. Huge, gnarled trees seemed to anchor everything in place. As we drove slowly up the mountain, we encountered women carrying masa (dough for making stuffed tortillas called papusas, the national dish) in bowls on their heads. Herds of cows passed by. We were met at the cooperative by Miguel Angel Montes, secretary, and president Francisco Antonio Carpio, among others. Their cooperative was formed in 1980 as a result of land reform, and currently has 126 members, and employs up to 400 people on a regular basis. During harvest that number swells to about 2,000. In total about 2,000 people live on the mountain, and the co-op is the main source of economic activity there. The coffee is organically produced and certified through the Organic Crop Improvement Association International. OCIA is a nonprofit, member-owned, organic certification organization and an accredited world leader in the certified organic industry. At El Jabali, we toured their processing facilities, where we learned how coffee is produced. Despite the machines that clean the beans and prepare the coffee for roasting, there is a lot of hand-work that goes into harvesting, drying, sorting and grading the coffee. Having a better understanding of this made me wonder why coffee isn’t more like $50 a pound! Secretary Montes was a very dynamic speaker and an affable host who talked while he made espresso for us from the co-op’s coffee beans. Clearly, he is proud of the co-op. “The reason we are still standing here is because we are working together,” he said, as he explained how during the years after the land reform, people were tempted to sell their parcels, and some did because they were faced with a Catch-22: they needed the money and couldn’t wait for the benefits of cooperation. At El Jabali, the people who were dogged about sticking together in the co-op and keeping their land have benefited. For many of those who sold their land, they now have nothing, not even the house where they lived. For the residents of the mountain, the co-op has helped improve their quality of life. “If we have a profit, we have rights,” said Montes, and part of that equation is self-help. Up on a mountain, accessible only by a sub-par dirt road, the people have been all but forgotten by the government, but with the co-op, people have jobs, and money earned from the co-op allows them to have access to health care and education. Montes’ parting words to us were: “Life is a school wherever you go.” As we bounced back down the mountain, caffeinated and fired up, my home food co-op seemed far away. I didn’t become a member of my local food co-op so I could earn a livelihood or get access to health care and education. The powerful effect of cooperation to improve a community’s basic standard of living, the difference between a life of poverty and financial stability, seemed to tower in importance compared to my ability to get good groceries. But the more I thought about it, I shouldn’t underestimate my co-op’s contribution to my own quality of life. I understand that my co-op ownership is also an incredibly important part of what it means for co-ops to be stronger together. I am joining with others in pooling my limited resources (I’ll never have millions to invest in El Salvador’s infrastructure) to sustain the El Jabali cooperative by buying their coffee—a purchasing decision that supports my values of a more equitable food system. It also gave me a newfound respect for trailblazing organizations, like Equal Exchange, that work every day to help co-op producers bring their product to market under challenging circumstances. The impact we—producer co-ops, food co-ops, and co-op shoppers—have together is profound. 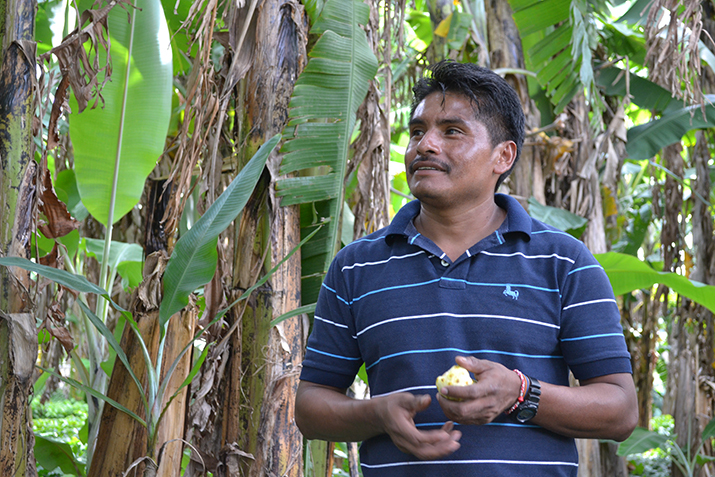 When I learned how much cooperatives benefited the Salvadorans, it deepened my commitment to my food co-op, too. I left El Salvador with a better understanding of the power of cooperation. My food co-op is sustaining co-op producers by making it a priority to carry their products; and my decision to buy them at the co-op benefits both the local and global co-op economy. Above all, it makes a real and important difference to me and the lives of others. When I fill a coffee bag from the bulk beans at my co-op, I remember the El Jabali co-op’s dream for a paved road. Together, we will pave the roads we travel.